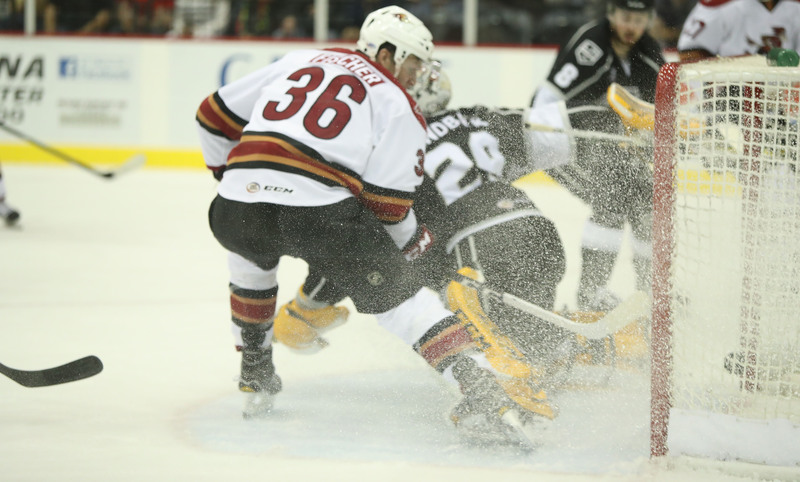 Goals were traded until Christian Fischer topped off Friday night’s affair with 7:33 left to play in regulation, catapulting the Roadrunners to a 3-2 victory over the Ontario Reign at Tucson Arena. With the win, the Roadrunners maintain their first-place position in the Pacific Division and extend their club point-streak to six games. All five of Tucson’s wins this season have come by one goal. Ontario came out with a threatening push from the start, but Adin Hill and the Roadrunners defense were able to keep the Reign off the scoreboard until that potent power play Head Coach Mark Lamb referred to struck for the night’s opening marker via defenseman Jamie McBain. While working on the team’s second power play of the evening, McBain snuck low into Ontario’s zone and chipped a rebound from a Brendan Perlini shot past an out-of-position Anders Lindback. For McBain, the goal came against his former organization; he played in in a combined 47 games for the Los Angeles Kings and Ontario Reign last season. It was also McBain’s second goal in as many games. Ontario’s Vincent LoVerde answered the bell 1:17 minutes after McBain’s opening tally, tying the contest 1-1. Late in the second period, Michael Bunting received a gorgeous behind the back feed from Tyler Gaudet and wristed a shot past Ontario’s Lindback, putting the Roadrunners up 2-1, scoring a goal in his third consecutive game. Once again, though, Ontario’s Vincent LoVerde responded, tying the game less than two minutes after the Roadrunners had reclaimed the lead. 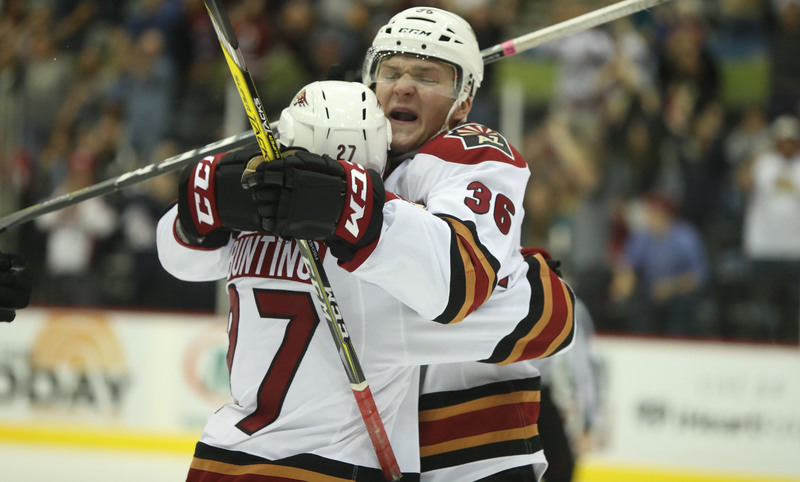 Tucson was able to take their third lead of the evening – and this one for good – when Christian Fischer jammed home a Michael Bunting feed on the end of a two-on-one sequence to put the Roadrunners on top 3-2 with 7:33 left to play. Adin Hill stopped 39 of the 41 shots that were directed his way Friday night, registering his fourth win of the season. Ontario came into the night with the AHL’s top power play unit, but the Roadrunners played a disciplined game, taking only one minor penalty throughout the night, and keeping the Reign’s man advantage grouping off the scoreboard. Forward Michael Bunting (1G, 1A) and defenseman Jamie McBain (1G, 1A) led all Roadrunners players in points scored (2).